In 1877 The National Tribune newspaper was founded. 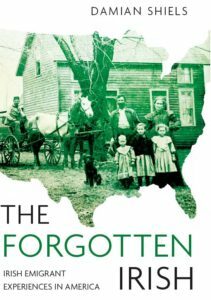 Aimed at Union veterans and their families, over the course of the following decades it provided many insights into not only veterans issues, but also their experiences of the American Civil War. There is much of relevance to those interested in the Irish experience of the conflict to be found in its pages, a topic I intend to explore further in future posts. Among them are first-hand accounts of Irishmen’s experiences of the war. 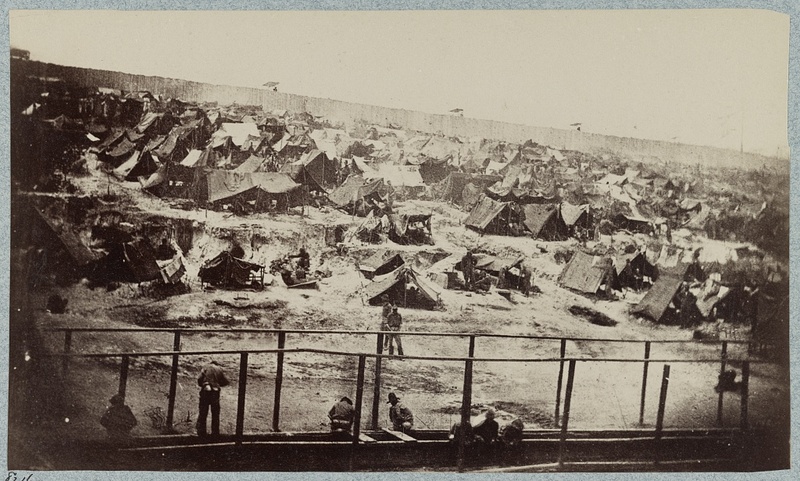 One was provided by John Conlin, a veteran of the 13th Pennsylvania Cavalry, “The Irish Dragoons.” In a piece published on 27th June 1907, John told of his experiences in the notorious Andersonville POW Camp. I was born in Ireland in 1844, but at the time of the great famine my family went to England. We Irish had a hard time of it in those days, fully as bad an experience as Andersonville, I think. I enlisted under the name of John Hollis, tho my real name is John Conlin, at Philadelphia, July 8, 1862, in Co. D, 13th Pa. Cav., and was captured the first time in a dashing charge up Fisher’s Hill, April 28, 1863, and was confined in Libby Prison 18 days. My next capture was Oct. 12, 1863, near Jeffersonville, Va., and was confined in Pemberton for a time, but taken out and sent to Belle Isle, where I nearly froze to death. Was there 51 days in the depths of Winter with only one blanket, which the Christian Commission gave me; no overcoat, no tent nor shelter of any kind. The citizens tore their awnings from their stores and sent us. The ground was new, and all the boys were soon coughing. I was sent to Andersonville before the stockade was finished, and am almost sure I saw you, Comrade McElroy, there at the time of the hanging [McElroy was John McElroy, a former prisoner who wrote of his time at Andersonville in Andersonville: A Story of Rebel Military Prisons. The hanging John refers to is that of the Andersonville Raiders, which you can read about here] . You had such a lot of sheets of brown writing paper, I wondered where you got it. The reason of Providence Spring was it rained for 40 days and nights and then this little spring of sweetest water burst from the ground [read about Providence Spring here]. The poor boys used to come down to get their drink before dark. They were so weak they used to lie down on the ground spoon-fashion, for warmth, and on an average there would be one-third of them dead before morning. There were two entire stockades around Andersonville, and before I left the last time they were building a third, 200 negroes working, who were allowed to exercise their lungs morning and evening. Fifty-six men were mounted as guard on the top of the stockade. Stoneman ran us out on Sept. 8, 1864, and oh, how good it was to get a breath of fresh air once more. Christmas Eve, 1864, however, I was back in Andersonville again. While we were away they had torn down and leveled the little shelter we had built, and plowed the ground up. I think the poor guards were really sorry for us. My outfit that day consisted of a cap, cavalry jacket, breech clout and a rotten blanket. April 17, 1865, they let us out. We were turned loose at Baldwin and I picked a quart of dewberries and ate them. The sailors met us on horse and mule back loaded down with canteens of whisky and gave us each a good dram as they came to us. We got to Jacksonville April 28, and my, weren’t the people of that place kind to us. They gave us clean clothes and little dainties to eat they thot we would like. I got my commutation at Annapolis, Md., and my final discharge at Harrisburg from the War Department, July 11, 1865. United States Federal Census 1900. United States Federal Census 1910. The National Tribune 27th June 1907. John Conlin Pension Index Card. United States Army Register of Enlistments. Historical Sketch of The Third Regiment of Cavalry. Damien, It’s very good that you are posting these excerpts, stories from a traumatic period in USA and Irish history. What a juxtaposition: the Civil War taking place barely ten years following the Gort Mor (the Great Famine). Interesting published at turn of century, paper capturing stories of the soldiers’ experiences…..Similar to our interest today in the actions of men who served in WWI1 – as we try to learn of their war stories before they all die off. Interestingly, John Conlin served in the same PA Cavalry unit as CPL Michael Dougherty (another emigrant from Ireland). CPL Dougherty served with Co B &M of the 13th PA Invf Regt (Cavalry was attached to Inf Regts early in the CW) at different times,was captured by the CSA twice in the Shenandoah Valley campaigns, spent time in four CSA prisons Including Libby and Bell Island,VA.and Andersonville, GA. He survived the explosion and sinking of the Sultana on the Miss river. He won the Congressional Medal of Honor (CMOH) in 1897. His CW Diary was published in 1911. I would be glad to provide you with more info and his diary. Many thanks for the comment and the info! I know Michael’s story well and actually know his hometown of Falcarragh well. The local cafe there now has a bit of information up on him which is great to see. A fascinating character!